It is nearly impossible to overstate how valuable options can be for traders. The benefits to using options for trading are numerous and straightforward. In many cases, the more traders get used to using options, the more they realize how beneficial they can be. For example, traders will often begin experimenting with options because of the leverage they provide. Having 1 option equate to control of 100 shares of stocks can certainly lead to greater returns than simply using stocks. However, options leverage is more than just increasing returns. The leverage component also means traders can trade stock they may not normally be able to afford. Take Amazon(AMZN) for example. It’s nearly an $1,800 stock. With options, you could conceivably control 100 shares ($18,000 worth) of AMZN for a few hundred dollars. Options can also provide access to strategies traders may not normally be comfortable with, such as short selling stock or trading commodities. Using options can make these strategies simpler and safer than they’d otherwise be. But options can provide other benefits above and beyond how they’re used in trading. In fact, studying the options market and following options action can be highly instructive and rewarding. Big investment firms, funds, and trading desks will often use the options market to establish their positions in stocks and ETFs. Traders can often get an idea of what the smart money is doing by following big, block trades in options. Sometimes, block trades will occur in stocks you’ve never heard of or that rarely trade in big volume. These situations can be particularly useful. Not only are they easier to spot among the noise of everyday trading, but it can often be easy to tell what the goal of the trader is. 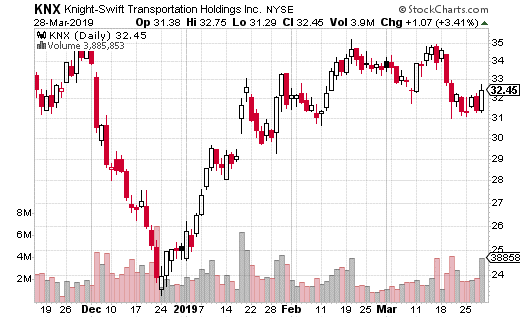 For instance, let’s look at a large block trade in Knight-Swift Transportation (KNX). The trucking and transportation company trades about 2.5 million shares a day on average, but only about 2,000 options. So, when a massive options trade hits the wire in this name, it can be an eye-opener. This particular block was a trader buying 20,000 August 35 calls for $2.35 per contract with the stock trading at $32 per share. What this means is that KNX needs to be at $37.35 or above by August expiration for the trade to break even. The trader is spending $4.7 million for this trade, which is the max loss potential. So, this clearly is a very bullish trade and the strategist is risking a lot on the call purchase. After all, we’re talking about over a $5 move higher (over 15%) in a stock that doesn’t make big moves all that often. On the other hand, the trade will generate $2 million for every dollar the stock moves higher than the breakeven point. In other words, there is some substantial upside to this strategy. And, it isn’t likely someone is dropping nearly $5 million on calls on a whim. This is exactly the sort of situation where copying the trade is a reasonable strategy. KNX options don’t trade that much and a straight up call trade is pretty transparent. Someone thinks this stock is going up in the coming weeks. And, for about $250 – $300 you could control 100 shares of KNX for about 5 months. Options trader, Jay Soloff, makes his gutsiest guarantee of his 21 year career. If you use his strategies and don’t make 5X your investment, he will write you a check. It’s bold. Is It Finally the Time to Buy Gold Miners?